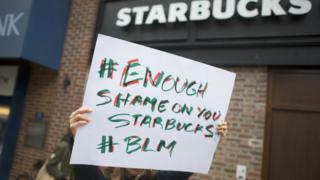 The arrest of two black men at a Starbucks in the US city of Philadelphia has sparked protests and boycott calls. The coffee chain's chief executive, Kevin Johnson, apologised for the arrests in a statement on Saturday. But protests continued, with many entering the store on Monday to call for the manager's dismissal. On Twitter, the hashtag #BoycottStarbucks has been shared tens of thousands of times. The arrests took place on Thursday evening. The two men, who had not made a purchase, were waiting for a friend to arrive when they were asked to leave by the store manager. They refused and police were called. A video of the incident posted on social media has been viewed close to 10 million times. Philadelphia police commissioner Richard Ross defended the police's actions in a video statement posted to Facebook. "It is important to emphasise and underscore that these officers had legal standing to make this arrest," he said. "They were called to the scene because employees said they were trespassing. "It is important for me to say that, in short, these officers did absolutely nothing wrong. They followed policy. They did what they were supposed to do. They were professional in all their dealings with these gentlemen." Online, the arrests have prompted anger and debate. Some social media users shared stories of discriminatory behaviour. Writer Brian O'Sullivan also linked the arrests to race. "I've seen many, many white people sit at Starbucks without ordering and I've never seen management ask them to leave," he said. "What happened is despicable," he added. The American Civil Liberties Union (ACLU) tweeted to demand "implicit bias training for police nationwide". "Sitting in Starbucks while being Black resulted in two men being arrested," the organisation posted on their official Twitter page. "Racial justice demands... profound culture change that upholds and protects the dignity of people of colour." In his statement, Starbucks chief executive Kevin Johnson said, "the basis for the call to the Philadelphia police department was wrong. "Regretfully, our practices and training led to a bad outcome.